Posted On October 01, 2017 by Team iCynosure. The facets of life are varied and the way each one of us looks at them are different; from work priorities to health benefits, from social skills to personality development. Most individuals put together different dimensions of life to complete a picture, however, as a mother I ensure that a complete picture includes physical, mental, emotional, social, financial and spiritual aspects. And to attain this, I diligently keep abreast with the nutritional needs of the body. My mother used to always tell me that no single food item is healthy or unhealthy, what is unhealthy is the lack of moderation. A balanced diet is an epitome of not only the prerequisite nutrients but also macronutrients like protein, carbohydrates and fat along with micronutrients like vitamins and minerals. The manner in which one can ensure health and wellness is to ensure a balanced nutritional intake that helps to maintain a healthy weight, retains necessary body fat, provides optimum energy, and promotes sound sleep. A diet that provides the daily requirement of calories from carbohydrates (50-60%), proteins (10-15%) and fat (20-30%); is considered a balanced diet. However, of late, there has been so much talk about ‘fat’ in a negative way, which not many people realise is both essential and healthy for a balanced outlook. Fat not only provides energy for proper functioning but also assists in processing vitamins and synthesizing hormonal balance. Fats, both polyunsaturated such as walnuts, flax seeds, etc; monounsaturated such as olive oil and omega-3 fatty acids such as fish oil, etc help reduce bad cholesterol levels in the blood which can lower your risk of numerable diseases and illnesses. According to ICMR recommendations, the Dietary Guidelines specify that the total fat in an Indian diet should be able to provide about 20-30% of total calories. The total fat intake in diets could go up to 50g per person per day based on the level of physical activity and physiological status. To maintain this balance is a huge challenge for mothers like me as kids these days dictate what food items are served on the dining table. I prefer the trial and error method, where my little princess is concerned. However, the trials are only when I’m sure about the quality of the product. One of the staple items on the dining table remains MAGGI Noodles. Most mothers I know will repeal in horror, but did you really know that MAGGI Noodles strikes a fine balance between Protein, Carbohydrates and Fat similar to the recommendations made by Indian Council of Medical Research. 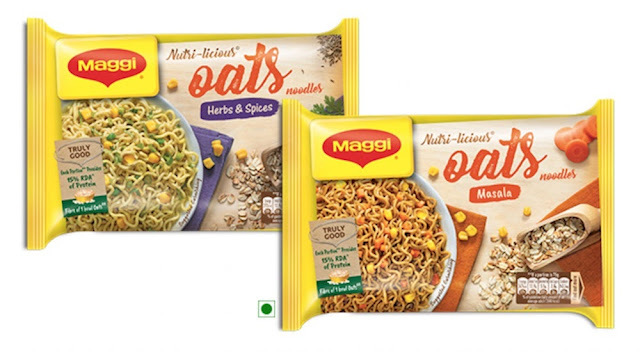 This reinforces my belief in the newly launched MAGGI Oat Noodles that provide the goodness of oats, the happiness of health and oodles of fun. As a mother who is vigilant about the food habits of the family, especially a young child; I’ve given my approval to MAGGI Noodles and I suggest you too, do not believe invalidated information, do your own research and say YES to health.